You don't have to work at Oracle or Apple to be among the top-paid executives in the technology industry, but it helps. Just a month after his unceremonious ouster as Hewlett-Packard CEO last year, Hurd landed the most lucrative job in the technology industry. As Oracle co-president, Hurd took home a base salary this year of nearly $700,000 in addition to a $7.3 million cash bonus -- some spare pocket change after he fled HP with a $12.2 million golden parachute. 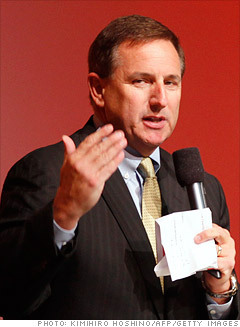 That severance package was supposed to be worth as much as $53 million, but in a settlement with HP over his decision to take the job at Oracle -- one of HP's direct rivals -- Hurd opted to drop all of his equity grants. As a "thank you," Oracle awarded Hurd a $2 million "extraordinary supplemental cash bonus." In a regulatory filing, Oracle offered up this gem: "[Oracle] does not routinely approve such bonuses but determined that this bonus was appropriate in recognition of the significant contributions made by Mr. Hurd, including, among others, his settlement of the litigation brought by Hewlett-Packard Company against him, which would have been a significant distraction to Oracle's management." Note: Total compensation includes annualized base salary, discretionary and performance-based bonus payouts, the grant-date fair value of new stock and option awards and other compensation. If relevant, other compensation includes severance payments. Equilar Inc., an executive compensation research firm in Redwood Shores, Calif., prepared the data by looking at companies with more than $1 billion in revenues that filed proxies by Sept. 30, 2011. Some of the biggest names in tech make just $1 a year. What happened to curbing CEO pay?